People like eating fish, right? It's good for you, abundant, and somehow exempt from the rules of vegetarianism. However, if you describe the taste of fish as "fishy," it usually means it isn't very good. Why is that? Why is there an entire species of food whose flavors we actively try to cover up? MMOs are the fish of video game genres. It seems to be that ever since World of Warcraft stopped being the biggest current event, MMOs go to great lengths to lose their MMO flavor, and instead disguise it with action-RPG seasoning, cutscene sauce, and dialogue-wheel garnishes, but it rarely ever really succeeds. There seems to be a weird cloud over the MMO kingdom in the last few years, which is pretty well represented by the fact the announcement of classic World of Warcraft is the biggest news to hit the scene in quite a while. 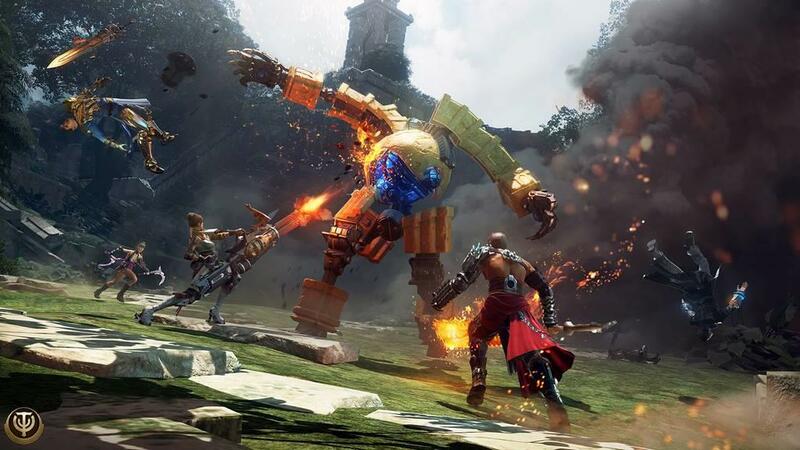 What all that preamble is leading up to is this: MMOs need to give you a reason to play them instead of WoW, The Old Republic, Guild Wars 2, or The Elder Scrolls Online, which is next to impossible these days, since all four of those are built on the success of their franchise. 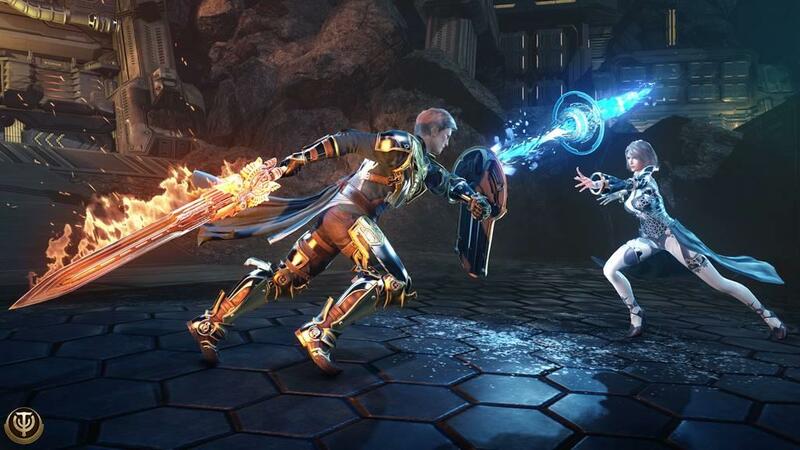 What does Skyforge, a new IP from a small developer, offer players to pull them away from the established juggernauts of the scene? 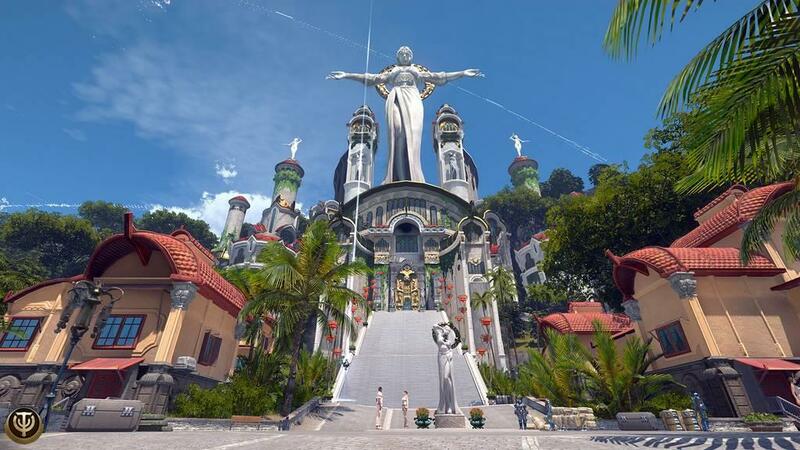 The first thing I noticed about Skyforge is what a beautiful and well-designed world it inhabits. It's a blend of fantasy and sci-fi, with hand cannons firing lasers alongside armored men fighting with sword and shield. The graphics are very high quality, with an art direction to match. Taking in the scenery of each level is easily the most enjoyable part of the game, even if the game itself does tend to boil down to a series of hack-and-slash corridors. 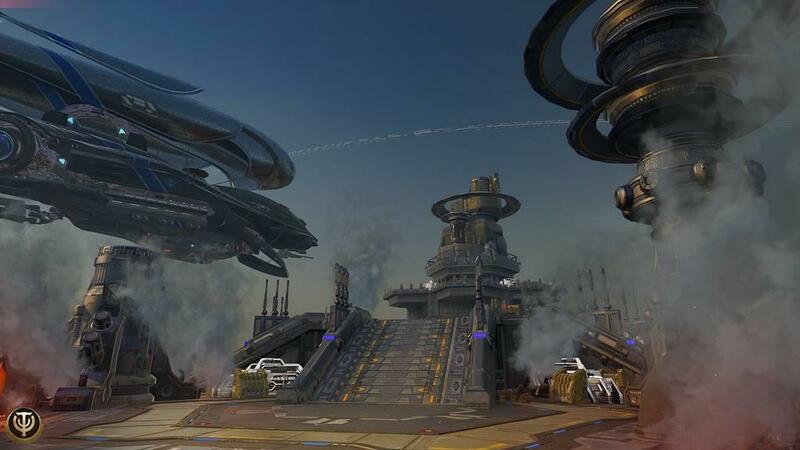 Even though the art design and graphics are excellent, I would not go so far as to say that the production is. The writing is mediocre at best; there's an interesting setting here, but it's told through a really bland story that's hard to get interested in. The weird sound editing is probably largely at fault here. And oh my God, the dialogue is something else. This game genuinely has some of the worst voice acting I've ever heard. The lines and dialogue are delivered with all the gusto of a tenth grade literature class being forced to read Shakespeare out loud, if the Shakespearean dialogue was rewritten by George Lucas to be "faster, more intense." It feels like they just abandoned ship with the writing dialogue somewhere along the way. Even the subtitles very rarely match up with what is actually being said, which is one of the strangest examples of laziness I've seen in a long time. 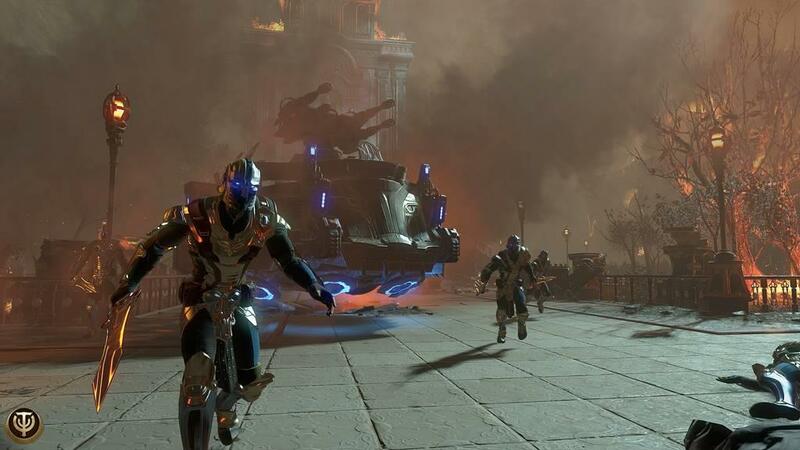 If you can get past that to the gameplay, Skyforge is fine. The speed of combat is much higher than is usual for MMOs, which is a positive, but this was achieved by really limiting the amount of actions your character has to chose from. 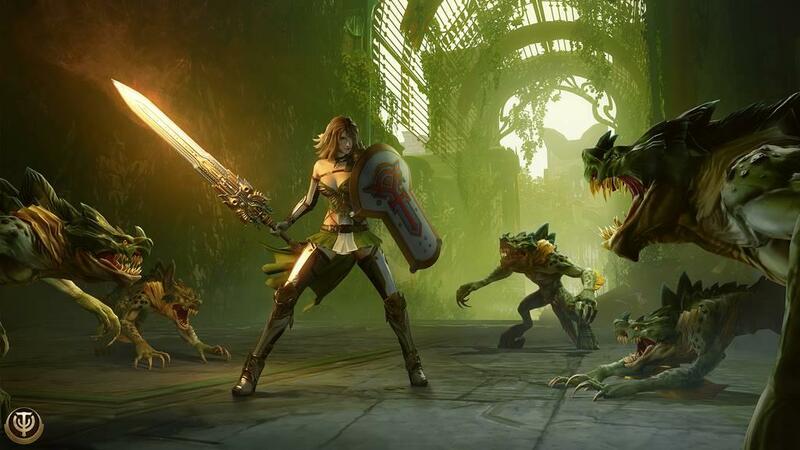 It feels much more like a hack-and-slash game than an RPG. 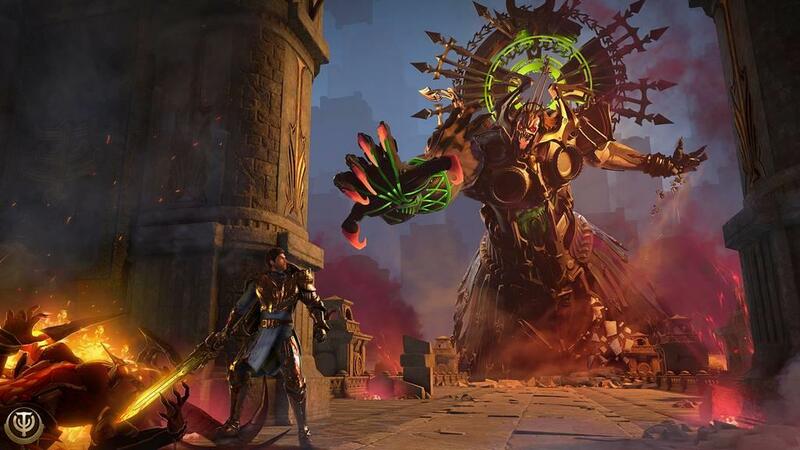 This is perfectly fine, but it doesn't feel like an especially good action RPG—think more Victor Vran, less Diablo. While the combat itself is satisfying enough, Skyforge really loses a sense of world building by having every level function as an instance. There's very little overworld to explore, mostly limited to a capital city hub. It's a shame, too, because the world that the game is hinting at seems really interesting and fun to explore. Instead, you go through levels which amount to a series of corridors. 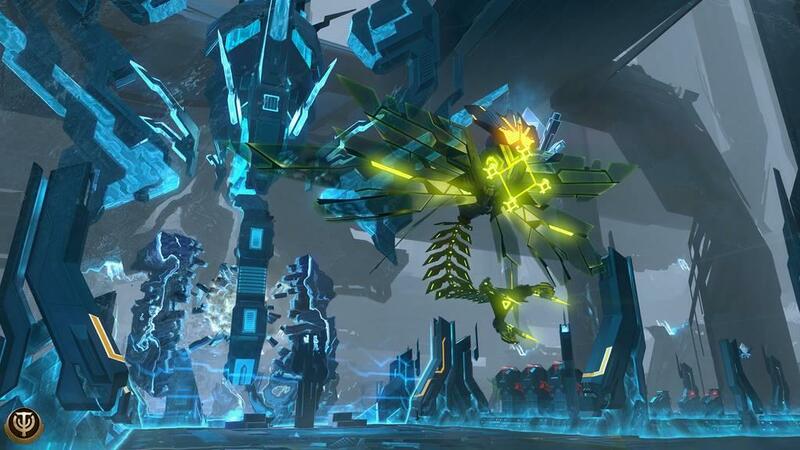 If you've played Phantasy Star Online, the level design and hub world will feel quite familiar to you. The MMO mechanics are there, with different classes, loot, and level ups. The classes are very well handled, because you can change between them at any time. This is a really nice way of opening up the gameplay possibilities for the player, without restricting them to a single class per character. Unfortunately, most of the RPG mechanics are tucked away behind an inaccessible user interface. Menus are sluggish, item stats are next to impossible to find, and often your menus are be ironically obfuscated by hint windows telling you where to go. The whole thing feels really clumsy, almost like it was not designed with a controller in mind. That's a common problem with console MMOs, but for once, this one actually was made with consoles in mind, as it released first on PS4 in 2015. 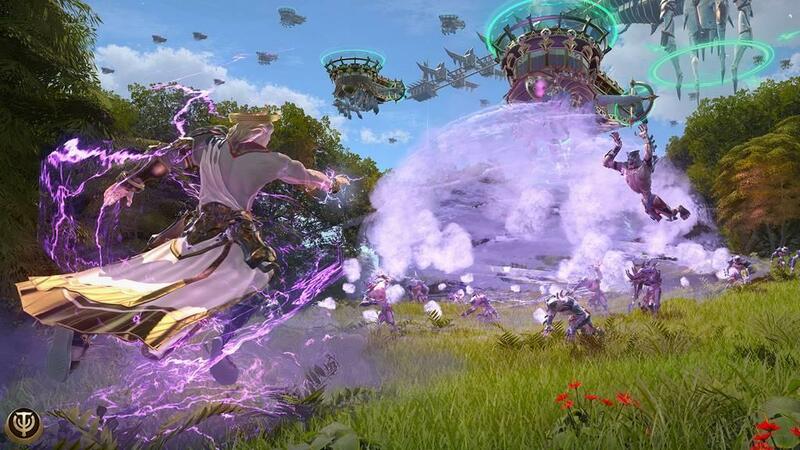 Skyforge is also ridiculously easy. When fighting enemies, they practically bleed health potions for you to pick up and automatically use while fighting them. It feels like the game is apologizing for damaging you every time you get into an encounter with a boss enemy. It was uncommon for me to finish a boss fight without full health, which is such a weird situation to find in an MMO. When playing as the gunner class, I could easily defeat any enemy simply by holding down the right trigger and slowly walking around the enemy in a circle. Whatever interest there could have been in an otherwise responsive combat system is squandered by the complete lack of effort required to succeed. 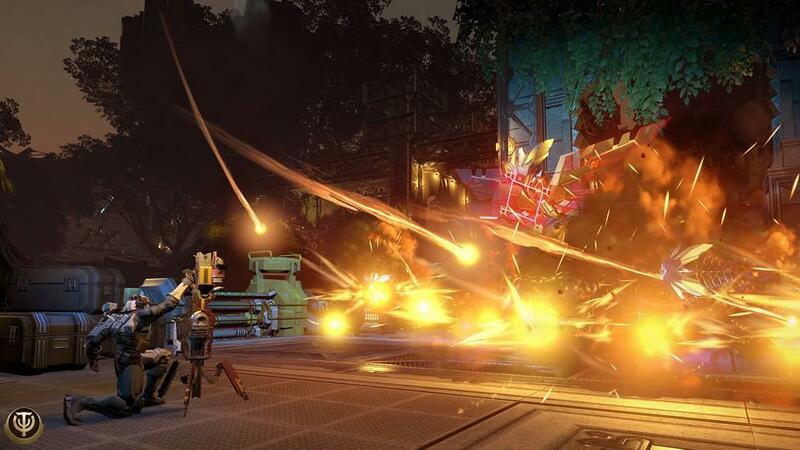 Skyforge has a lot of problems. Thankfully, it is free to play, so you won't be punished if you want to try it out. I think there could be some potential here, but there's a lot of work that needs to be done yet. 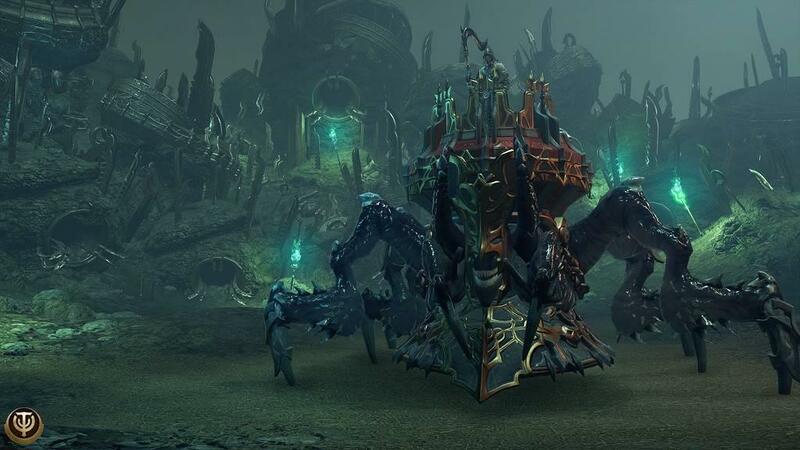 As of now, there still isn't a convincing reason to stray away from whatever MMO you're currently playing.